This virtual exhibition presents the global reception and impact of Rachel Carson’s Silent Spring as well as the book’s legacy in popular culture, music, literature, and the arts. Read chronologically starting with the overview, or go directly to a specific chapter that interests you by clicking on the navigation slider below. Tests of hundreds of nuclear weapons in the open air spread radioactive fallout from pole to pole—invisible cancer-causing isotopes that found their way into food and into human bodies. Public alarm was coming to a peak just when Silent Spring came out. “Elixirs of Death,” “Needless Havoc,” “And No Birds Sing,” “Rivers of Death,” “Beyond the Dreams of the Borgias”: Silent Spring’s chapter titles seem to promise a lurid muckraker. The text, however, is impassioned but scrupulously scientific. Critics called the book inaccurate and exaggerated but they could never name specific examples of errors. The most telling criticism was that it one-sidedly omitted any positive benefits of chemicals. Rachel Carson’s defenders responded that the chemical industry’s promotion efforts had already done that quite well. Other writers had written on overuse and misuse of chemical pesticides and herbicides and hardly anyone noticed. Why was Silent Spring so different? The most important reason was Carson herself, the most popular nature writer of the 1950s, with three recent best sellers. As the latest book by Carson, Silent Spring had a ready public who looked forward to it with keen interest. Second was the quality of the writing itself. Surely no one but Carson had the literary skills to write an international best seller about chlorinated hydrocarbons. Decades of writing science for the public prepared her to present complex science to the general public in ways that both made it readily understandable and drew the reader in. Finally, recent events and health scares had prepared the American public to hear and respond to the frightening message of Silent Spring. Most dramatic was the worrisome spread of radioactive substances across the globe from a spree of open-air tests of nuclear weapons. Carson explicitly compared pesticides to radiation: both were invisible, unavoidable, and threatening. Her explicit comparisons to now well-known health dangers from radiation made her task much easier to explain the very similar threats from dangerous agricultural chemicals. Silent Spring specifically mentioned the unlucky radioman aboard the Lucky Dragon, a Japanese fishing boat. In 1954, the boat was working downwind of a hydrogen bomb test in the Pacific that unexpectedly covered it in radioactive fallout. The illness of the crewmen, the death of the radioman, and US government denials caused a major international incident. Alarmingly, radioactive fish from the Lucky Dragon and other downwind fishing boats went on the market in Japan and were consumed before anyone realized the danger. 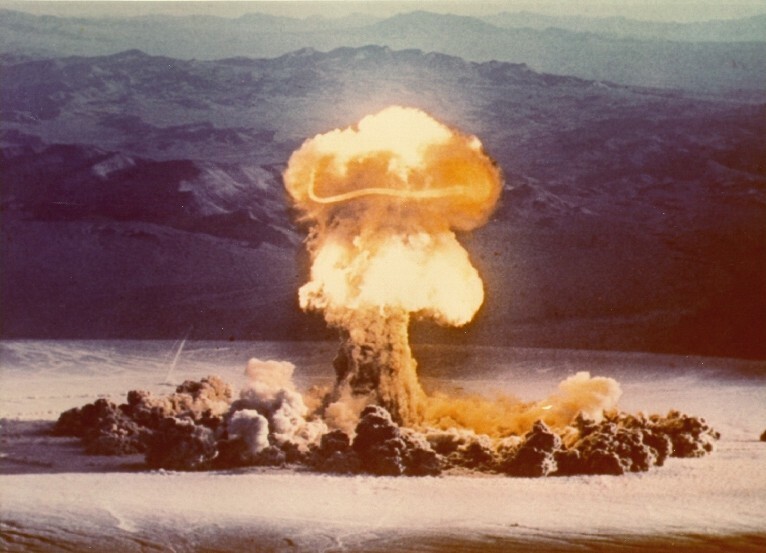 The first pollutant named in Silent Spring was not a pesticide but strontium 90, a radioactive byproduct of nuclear explosions. Scientists at Washington University in St. Louis had recently published preliminary results of their “Baby Tooth Survey,” in which they tested hundreds of thousands of baby teeth. Analysis showed that children’s teeth (and by implication their bones as well) had absorbed strontium 90. The Baby Tooth Survey convinced President Kennedy to negotiate the Nuclear Test Ban Treaty of 1963. Carson also alluded to a health scare about contaminated food in 1959. Just before Thanksgiving, Secretary of Health, Education, and Welfare Arthur Flemming announced that some cranberries had been contaminated by a weed killer that was known to cause thyroid cancer in laboratory rats. A traditional Thanksgiving dish, few cranberries were sold that year and cranberry growers suffered huge losses. 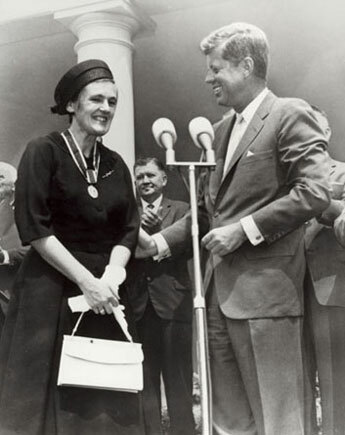 FDA medical officer Frances Kelsey receives the President’s Distinguished Federal Civilian Service Award from President John F. Kennedy at a White House ceremony in 1962. 1962 Federal Drug Administration View source. Then in 1962, just as Silent Spring was being published, reports hit the media that Frances Kelsey, a female physician with the Federal Drug Administration, had single-handedly prevented sale of thalidomide on the American market. Journalists revealed for the first time how doctors in Europe and Canada had prescribed the drug to prevent morning sickness during pregnancy, resulting in appalling birth deformities. That a lone woman stopped a powerful chemical agent misapplied by well-intentioned experts brought home the message of Silent Spring as few events could. Consequently, when best-selling author Rachel Carson’s Silent Spring appeared in bookstore windows with its well-told tales of invisible chemical poisons pervading the world and contaminating food, it raised a public clamor that was heard around the world. This refers only to the text and does not include any image rights. Please click on an image to view its individual rights status.